Scientists searching for signs of life beyond our solar system should keep an open mind, for planets very different than Earth may well be habitable, a prominent researcher says. While it may seem natural to zero in on "alien Earths," such a narrow focus would exclude many potentially life-supporting exoplanets, whose diversity continues to astound astronomers, says Sara Seager of MIT. "The number of planets that we're going to be able to see in our lifetime — and look at their atmospheres for signs of life— is so small that we're forced to be open-minded," Seager told SPACE.com. Seager discusses exoplanet habitability in a review article published online today (May 2) in the journal Science. Scientists discovered the first alien planet around a sunlike star in 1995. Since then, the tally has grown to more than 700 (or more than 800, depending on whose list is consulted), with thousands more candidates waiting to be confirmed by follow-up observations. Some of these alien worlds are broadly similar to planets in our own solar system. But many others are truly alien — enormous "hot Jupiters" that whip around their parent stars at extremely close range, for example, or "rogue planets" that cruise through the cold depths of space alone, with no parent star. Just where this habitable zone lies for each planet depends on a number of factors, most crucially its host star's brightness and the planet's atmospheric makeup. "It's really all about the greenhouse gases," Seager told SPACE.com. "The greenhouse gases are like a blanket that moderates the temperature at the surface." 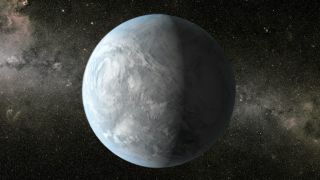 The conventional definition of the habitable zone assumes a roughly Earth-like atmosphere, dominated by nitrogen, carbon dioxide and water vapor. But the huge diversity of alien worlds argues for a new way of thinking, writes Seager, who literally wrote the book on exoplanet atmospheres ("Exoplanet Atmospheres: Physical Processes," Princeton University Press, 2010). For example, large and/or chilly alien worlds could conceivably hang onto their gaseous molecular hydrogen, which long ago escaped from small planets such as Earth, Venus and Mars. Hydrogen is a powerful greenhouse gas that could make liquid water possible on a number of worlds far beyond the outer edge of the traditional habitable zone — and perhaps even on seemingly frigid rogue planets, Seager writes. Similarly, the habitable zone may extend inward, toward the host star, on "dry" rocky planets whose atmospheres have much less water vapor than Earth's does. So it's best to consider alien planets' potential to support life individually, on a case-by-case basis, Seager says. Seager and others stress that a better understanding of exoplanet habitability is key to the next phase of the alien life hunt, which seeks to search promising candidates' atmospheres for water vapor and gases that may have been produced by life. Astronomers have already scanned the air of a few dozen planets using NASA's Hubble Space Telescope and other instruments, Seager said. But those were hot Jupiters with big, puffy atmospheres — relatively easy targets that aren't intriguing from an astrobiological perspective. Scientists plan to do the same with smaller, potentially habitable worlds soon, Seager said. They'll use the Transiting Exoplanet Survey Satellite, which NASA recently approved for a 2017 launch, to identify promising candidates relatively close to Earth. Then NASA's James Webb Space Telescope (which is scheduled to blast off in 2018) will follow up, getting an in-depth look at these worlds' air. Though JWST is designed to be incredibly powerful, the $8.8 billion instrument will probably only be able to investigate the atmospheres of exoplanets that lie within a few tens of light-years from Earth, Seager added. Seager said she hopes her review article in Science helps her fellow astronomers make the most of this small pool of observable candidates. "I hope it gets people to realize that so many types of worlds could be habitable, and that our chance of finding one is higher when we accept that," she told SPACE.com.